Supreme Court nominee Brett Kavanaugh delivered a belligerent opening statement to the Senate Judiciary Committee last Thursday that hinged on rhetoric put forward by the right-wing organization Judicial Watch. 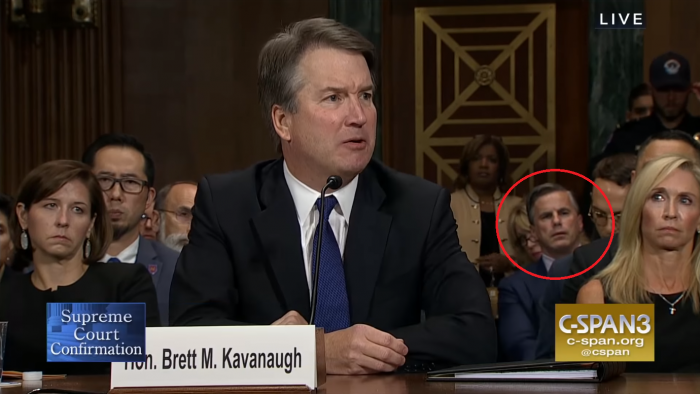 As Kavanaugh spoke, behind him sat Judicial Watch president Tom Fitton. On Thursday, Capitol Police told this reporter that the hearings were invitation-only. Judicial Watch is a conservative political group founded by Larry Klayman in the 1990s to hound the Clintons with lawsuit after lawsuit in hopes of scoring information that could be ginned up into a scandal, a drive it carries on to this day under the leadership of Fitton. In recent years, Judicial Watch has propped up false claims that the Clinton Foundation acted as a slush fund through which foreign leaders could bribe Clinton during her during her tenure as secretary of state. It also has promoted the president’s made-up claims that his campaign was spied on by the Obama administration (on Clinton’s behalf), and has been banging the war drum against billionaire philanthropist George Soros, who funds progressive and liberal groups. Since Kavanaugh’s nomination to the Supreme Court, the organization has taken up arms in defending Kavanaugh against a perceived conspiracy to block his nomination. In July, the organization stated that Kavanaugh’s nomination was a “home run” and that it expected “to see leftist smears, religious bigotry, more threats of violence, etc.” against Kavanaugh. Andrew McCarthy, a Fox News contributor who spent years appearing on Judicial Watch panels, decried the reports of allegations against Kavanaugh as “a setup.” On September 24 it claimed the allegations against were part of “a search-and-destroy mission by leftist partisans.” Fitton said it would be a “Soviet-style hearing” if Kavanaugh was forced to answer to the Senate Judiciary Committee about the accusations levied against him.